Happy New Year Americhem! We are proud to have given back in 2016 both in our local communities and on a global scale. We are honored to be able to support several organizations this season. Throughout the year, Americhem’s facilities in the Americas raised money for United Way, while also donating food and other goods to families in need this holiday season. We set high goals, and strive to exceed them all while having fun and serving our communities. Our plants across the US host chili cook-offs with employees competing for the top cook title, food drives for local school children and entire days of service in hopes of bringing joy and an extra hand to our neighbors. 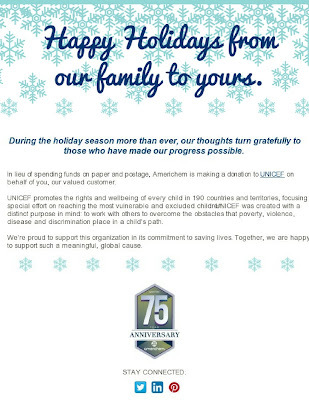 Our dedication to our communities expands to a global scale with our annual holiday card. 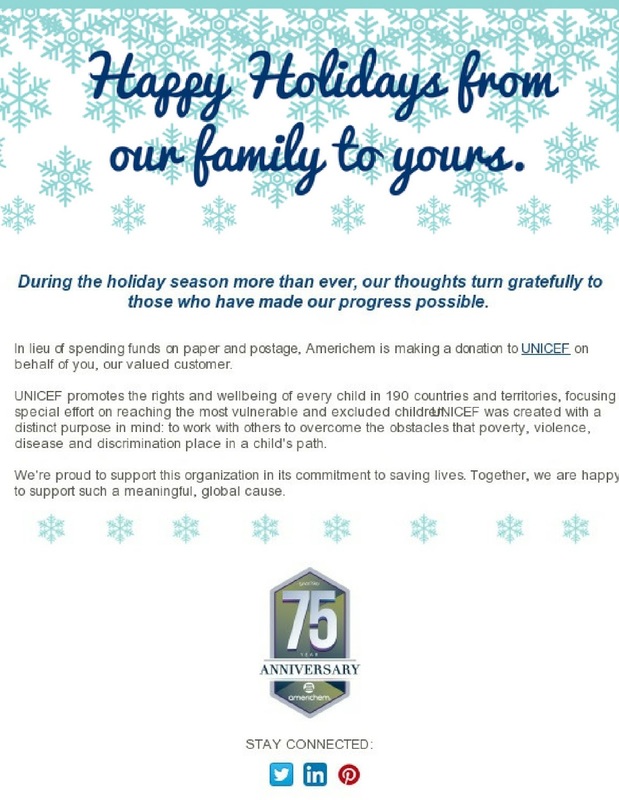 In lieu of paying for printing and postage for our annual card, Americhem sent an ecard and donated all funds saved to UNICEF on behalf of our customers. Americhem is proud to have a workforce so dedicated to making a difference. As one of our guiding principles, our employees strive to live the Americhem values in and out of the workplace. As an organization, we value those who go the extra mile. Lonnai Meraci of Vi-Chem was recognized this year at our annual Sales and Managers’ Meeting for her efforts to improve the lives of others. When Lonnai Meraci first joined Vi-Chem in 2003, the company participated in the American Cancer Society’s Making Strides Against Breast Cancer 5K walk. The walk gives the community an opportunity to unite and honor breast cancer survivors and raise awareness. The money raised helps the American Cancer Society fund ground breaking research, provide support and mammograms to those who normally would not be able to. Since then, Lonnai has participated in the walk every year. She has taken the lead to pull 14 or more people to walk every year, and raised thousands of dollars. Her passion continues to build awareness and participation each year. Americhem hopes to continue to work and inspire our employees, partners and communities to give a little extra in 2017!